The Recorded Sound Archives loves sharing the gift of music during the holiday season, especially Chanukah music. 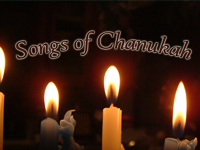 This year the Recorded Sound Archives has put together a wonderful collection called Songs of Chanukah that will entertain and delight the entire family with over 50 albums to choose from such as the Children’s Village Choir singing Hanukkah is Here to Kenny Ellis with Hanukkah Swings. The songs in this collection express the essence of the holiday with children’s songs that teach about the holiday, traditional songs and a new twist on old favorites. Please accept this gift of music for you and your family from the Recorded Sound Archives along with our best wishes for a Happy Chanukah! Click here to view past blog posts on Chanukah.